Though Wang Guangyi’s work has erroneously been associated with Chinese Political Pop, in reality one of the main themes of his art can be found in its relationship to the transcendent. Juxtaposing revolutionary images with consumer logos, Wang’s canvases provocate with their duplicitous message, highlighting the conflict between China’s political past and commercialised present. Stylistically merging the government enforced aesthetic of agitprop with the kitsch sensibility of American pop, Guangyi’s work adopts the cold-war language of the 60s to ironically examine the contemporary polemics of globalisation. Through his critique, Guangyi’s paintings weave intricate narratives, implicating the role of the artist as an active participant (both as subjugator and subservient) in economic and social policy. Guangyi treads a very delicate line between moral dictum and capitalist endorsement; the interpretation of his paintings alternates with the subjectivity of context. Amalgamating, confusing, and blurring opposing ideological beliefs, Guangyi’s billboard sized canvases readily sell out national valour, while simultaneously devaluing status symbol luxury for the proletariat cause. 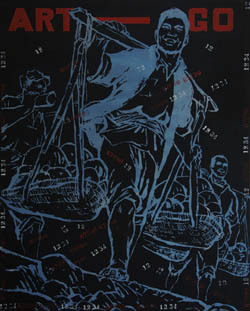 Guangyi’s Materialist’s Art is exemplary of a new "cultural revolution". The dramatically outlined figures brandishing red book gospel, set against flat planes of colour, are rendered in a style specific to Chinese government issue posters of the late 60s and early 70s. 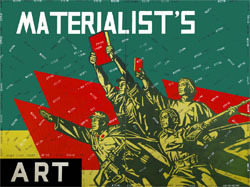 Emblazoned with the words " Materialist's" and "Art" the messaging is both condemnation and incitement, a statement of radicalisation and power, repositioning the aesthetics of totalitarian authority as a signifier of absolute and extravagant decadence. Guangyi’s Aesthetics of War - Blue No. 3 operates as a dual narrative. Combining the graphic styles of comic books and instructional manuals with scrawled blackboard-like text his work points to a visual analysis that's equally personal and pedagogical. Rendered in X-ray tones, his tableau is situated in the realm of science fiction and adventure, giving a sense of toxicity and danger to the pop motifs and generic script, questioning the implications of public images as coded messages and the tacit role of the artist as producer. In the mid-1980s, Wang Guangyi espoused a humanist vision of art for post-Mao China. 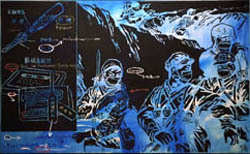 His series of paintings entitled "Frozen North Pole" sought to evoke, in the artist's words, "a kind of beauty of sublime reason which contains constant, harmonious feelings of humanity." 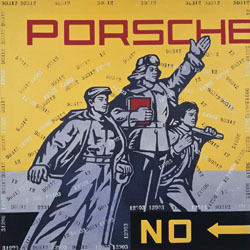 Wang Guangyi's aesthetics entails sampling of various imagery (such as well-known propaganda-images and photographs), and fusing them with corporate brand-names in order to undermine their original purpose. In combining ideology and advertisement, he criticizes the apparent 'truths' of both. In short, he marks the Socialist Realist iconography and symbols with another contradictory discursive system. The Materialist series of sculptures I created in 2001 can be said to have grown out of the work I had been doing previously with site-specific installations. The experience of using every type of material and format in these works was a freeing experience. Wang Guangyi is the leading protagonist of the post-1989 Political Pop movement - one of the major artistic movements to have developed in the aftermath of the events of 1989 - Tiananmen Square and the closure of the China/Avant Garde exhibition at the China National Gallery.